Sleep: One of the most coveted and elusive things in parents’ lives. I would say “new” parents, but my friends and family tell me, in reality, it’s years before it gets much better. As newborns, our babies need us every three to four hours for feedings. As they grow and night feedings fall away (this happened around 14 weeks for my twins), you slowly begin to get longer stretches, but now the night wakings are more random. They lost a pacifier, or they are cold, or their teeth are bothering them, or it’s a growth spurt and they do actually need a bottle. I remember this period being even harder than the newborn stage because there wasn’t any rhyme or reason as to why they would wake up. And of course, with two, often as soon as one is down the other is waking! I would venture to say sleep deprivation is the most challenging part of new parenthood. Everything is harder when you are exhausted, and exhaustion can make it difficult to think clearly and maintain routines. You feel like you will do anything for just a few uninterrupted hours! However, as a Type A personality, I personally thrive on structure and routine. As an elementary school teacher, I also know how important routines are for young children. This is why I attempted to establish routines as soon as possible with my newborn twins. Both for my sanity and for predictability for them. Quality sleep is essential for growing babies and their brain development. When children sleep well they then have periods of optimal alertness while awake, allowing for improved cognitive function which increases brain growth and leads to other neurologic benefits. Quality sleep comes from predictability and structure. My twins were born at 38 weeks to the day and did not need any NICU time. Several of my mom friends had told me the NICU was especially helpful for getting their twins on a schedule. For this reason, we opted to stay an additional, fourth night, in the hospital to try and get on a schedule before heading home. Luckily for us, this worked really well. The nurses helped us establish an every three-hour “nurse, pump, sleep” routine that transferred well once we came home. 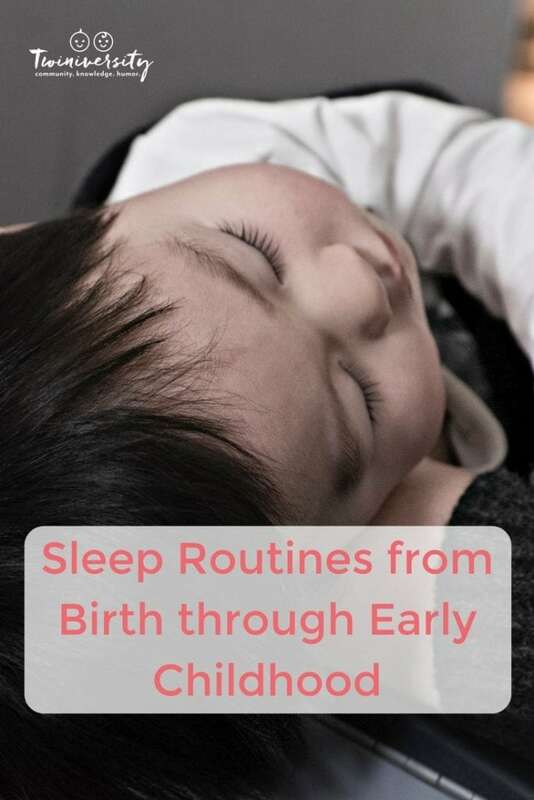 I’ve found having a routine and schedule has been the most beneficial long-term in establishing healthy sleep patterns for my twins. 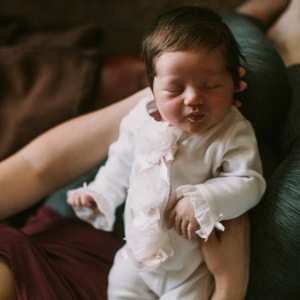 As they grow their sleep needs obviously change, so here are some basic guidelines in terms of what to expect in the first few years. Newborns are notoriously sleepy. In these first few weeks, most newborns will sleep between 15-19 hours a day. At this stage, most parents are advised to feed their babies every three hours (or every 2 – 2 ½ hours, if you’re breastfeeding), which also means it feels like all you are doing these first weeks is surviving from one feeding to the next. Your newborns should wake for a feeding, stay awake for a short period of time, then fall back asleep for a nap until the next feeding – all within a three-hour window! Because routine feedings are so important in these first weeks it can be hard to establish a difference between naps and nighttime sleep, and wake times are not marked by distinct activities. 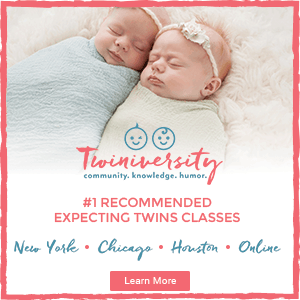 As your twins begin to move out of the newborn stage, you will begin to notice more distinct sleep patterns and nighttime sleep will become more distinguishable. 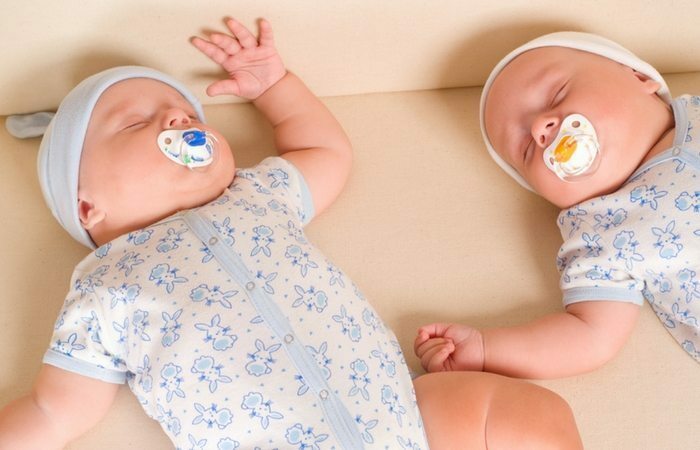 At this age, your twins need 14-18 hours of sleep per day, which includes 4-5 naps. You will likely still be in a three-hour feeding schedule during the day. Check with your doctor about when you can stretch to a four-hour schedule and lengthen nighttime sleep hours to include a four to six-hour stretch. Naps are generally an average of 1 ½ hours at this age. If following an eat, play, sleep routine you may now begin to view waketimes as a distinguishable period which can include age-appropriate activities. 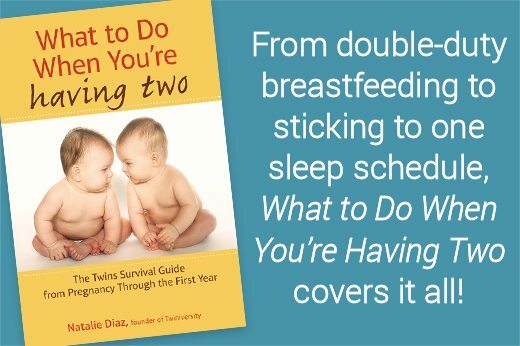 At this stage, my twins were able to drop their late-evening feeding (10:00 pm) and began “sleeping through” the night, which was approximately 10-11 hours. Your day will start with an early morning feeding, 6:30-7:00 am, and end with an evening feeding and bedtime between 8:30-9:00 pm. At this age, babies are also more capable of extending their waketimes, particularly in the morning. Many babies also begin eating solid foods during this stage which can also impact feed, play, sleep cycles. At this age, babies need 13-17 hours of sleep daily, including 3-4 naps. These naps typically include a morning and afternoon nap, which range from 1 ½-2 hours each, as well as a late-afternoon catnap, which may be more like 45 minutes to an hour in length. Babies in this age range need 13-15 hours of sleep daily, including 2-3 naps. Again, naps range from 1 ½-2 hours in length. Around six months of age the feed, wake, sleep cycles increase in length, so instead of three hours between daytime feedings, it may be 3 ½ to 4 ½ hours. Morning waketimes and bedtimes will remain similar to the previous stage. This age can be tricky as some babies need a third additional nap, the catnap, longer than others. 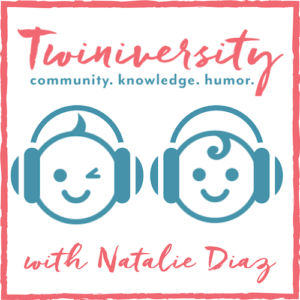 The transition from 3 to 2 naps was one of the most challenging transitions in my twins’ first year. Some babies may drop their catnap around 7 months while others won’t drop it until closer to 9 months. For my own sanity, I transitioned my twins at the same time. Nine to twelve-month-olds should sleep 12-15 hours daily including two major naps, one in the morning and one midday. Naps total 2 ½-3 hours each day, with the remaining sleep hours happening at night. Morning waketimes remain similar but bedtime may become slightly earlier as the third catnap drops away, perhaps 7:30-8:00 pm. These times are likely to stay the same for the next several months. At this age, babies are capable of sleeping 10-12 hours uninterrupted at night. Waketimes become longer, as some babies are able to stay up 3-4 hours between naps. One-year-olds need approximately 14 hours of sleep in a 24 hour period. This will likely be about 11 hours at night and the rest during the day. During the 12-18 month period, your babies will likely still be taking two major naps a day. As your twins approach the 1 ½ year mark the second nap will begin to fall away and their daytime sleep will be rearranged once again. Two naps will become one midday nap and will likely begin closer to the lunchtime hour. This nap may be as long as three hours as your babies are now consolidating their daytime sleep into one nap. At this age, babies need approximately 12 ½-13 hours of sleep, including one nap. This nap will probably be 1-2 hours in length and occur midday. During this year about half of the kids will stop napping and will get all of their 12 hours of needed sleep at night. Or, one or both of your twins may only nap some days of the week, but not every day. Pay attention to your child’s sleep cues and mood, as dropping this nap should come fairly naturally. Of course, managing our twins’ sleep comes down to best-laid plans. Sickness, teething, growth spurts, and numerous other factors can affect sleep in one way or another. The best way to manage these disruptions is just to remain consistent. Try not to create bad habits during these periods of time and stick as close your regular routine as you can. Pay attention to your own child’s sleep cues and adjust bedtimes accordingly. As I’ve learned, sleep begets sleep, and the more tired a baby becomes the more restless they are during their naps and nighttime sleep. No one schedule will seem perfect for your family, so establish one that does work for you while making sure your child gets the needed hours of sleep in a 24 hour period. Happy, rested babies means happy, rested parents! Carol Bridgens lives in Oregon and is a first-time mom to one-year-old twins, Graham and Maya. 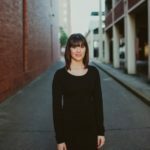 She is an elementary school teacher who is currently a stay at home mom. Her hobbies include CrossFit, Olympic Weightlifting, reading, and figuring out new ways to sneak vegetables into her twins’ food.